March 19, 2015 by fmgarchitects. The development of childcare buildings as a distinct building typology in Ireland is a relatively recent phenomenon. The boom in the provision of purpose built childcare buildings has been driven by increased childcare demand originally forecasted in The 1998 Study on the Economics of Childcare in Ireland as the labour force and the number of working mothers increased with Irelands economic development. Financially this was supported by by the EOCP and NCIP community funding schemes and tax relief on capital costs for private developers. The lack of references for childcare buildings in Ireland led the generation of young architects to seek references for similar projects in Northern Europe where established childcare systems existed and the design issues had already been addressed in various ways. Design issues which are particular to childcare buildings following our experience in recent years are explored as follows. Correct siting and massing of the building requires careful consideration. In addition to the conventional site layout issues that are normally addressed such as building lines/relationship to streets, drainage and vehicular access, the childcare designer must consider additional issues. 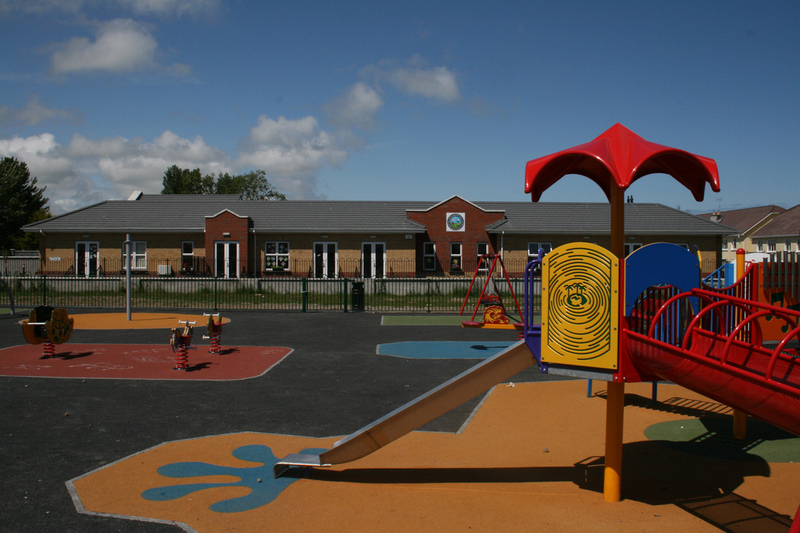 The security of the overall site and outdoor play areas, the significant area of car parking required for childcare facilities under many local authority development plans and the volumes of traffic that can arrive simultaneously for sessional services should be taken into consideration at early sketch design stage. The building could ideally have a south facing aspect over the outdoor play area in order that the outdoor space is not overshadowed as may be the case on a confined site and the play rooms would have a south facing aspect while having access and views of the play area. 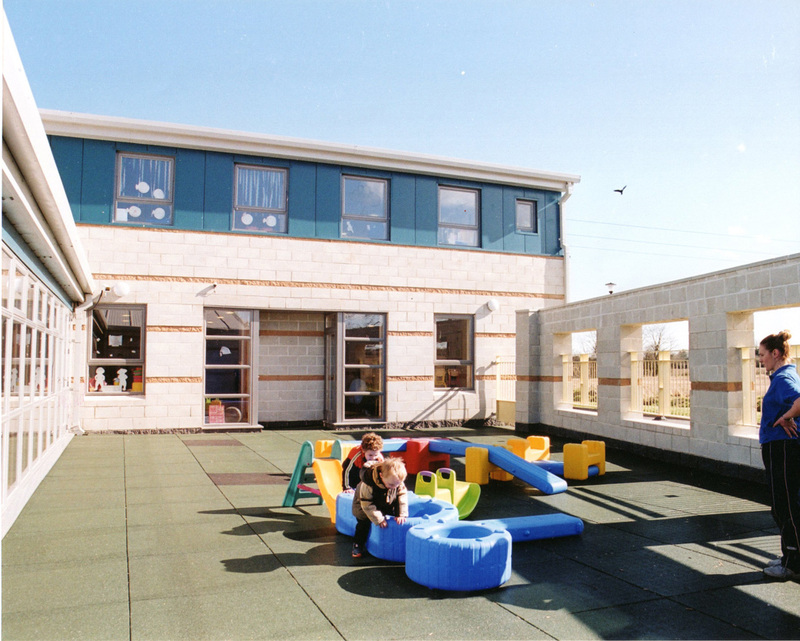 On restricted sites, the outdoor play space could be designed as a courtyard feature within the building block as was the case in phase I of the Jamestown, Ratoath project. Internally, the reception area should fulfill a number of roles. It should act as the welcoming face of the facility and fulfill a social function between parents and staff in addition to acting as the security filter for access to the building. The layout of childrens’ rooms requires awareness of a number of issues that may not be obvious to a designer who is unfamiliar with the childcare environment. In addition to providing a stimulating environment through light and colour, the shell layout should allow for flexibility in the use and furniture layout of the room should the age groups be reconfigured within the building. The use of modular folding wall panels can be useful in this regard to allow changes to the configuration of the rooms. Irregular shaped rooms can often be a successful shape as they create additional internal corners where play areas can be laid out. Although CCTV systems have become prevalent within most facilities, passive supervision both internally and externally is an important concept to be considered at early design stage. The positioning of staff areas such as managers office, parent meeting room, etc. with glazed elements to overlook entrance and circulation areas can allow for passive supervision by administrative staff of the facility. Vision panels/glazed doors between childrens rooms and toilet lobbys, sleep rooms and circulation areas similarly facilitate staff monitoring of their play group. The configuration of external windows and doors also requires specific consideration in relation to window opening sections and door ironmongery. Glazing should be at a height to allow young children a view out into the world. The creche offers the opportunity for designers to introduce quirky shaped windows which may add interest and scale to part of the room that is compatible to that of a childs height: the cill level of a window for a one year old may be a third or less of the height of what an adult expects! Designers should consider finger traps and friction stays to external doors (to prevent swinging) and restrictors to windows that open across external circulation areas at head height. There can be conflict between the issues of security, fire regulations and disabled access regulations that will have to be considered. With regard to the activity level and high occupancy of play rooms, the ventilation strategy for the building is an important consideration. It may be based on either a natural or mechanical approach: the former being based on traditional wall vents and window opening sections, the latter based on a ducted mechanical system with a constant regulated flow of fresh air which may incorporate a heat recovery function. The choice of system will generally be dictated by project budget and space for ducting. Recently developments in passive or demand controlled systems offer an alternative option where ventilation can be controlled through humidity sensitive wall vents and the stack effect combined with little or no mechanical input. The outdoor play area deserves as much consideration as the interior of the building. Imagination can be applied to economically create a more interesting environment through changes in level on a site with a gradient or by artificially creating mounds with surplus excavation material. A covered area can fulfill several functions: to allow outdoor access in wet weather, to provide shade in summer and to create a sense of security and enclosure for younger ages. Safety play surfacing should be provided around play equipment with the depth determined by the fall height of the equipment. It also provides all all weather permeable surface and a colour layout can facilitate games. Nevertheless there is nothing wrong with getting mucky if there is adequate space for the storage and cleaning down of small wellington boots! Underfloor heating has several advantages to a radiator based system: valuable wall space is freed up as the hazard of hot radiators is removed, the warm floor becomes a cosy place to crawl and roll and being a low temperature radiant heating system is considered to create a more healthy indoor environment. The floor finish should be easily maintainable with a a hygienic detail at junctions with walls and be capable of radiating the heat from an underfloor system efficiently if applicable. Underfloor heating systems are highly compatible with heat pump technology. 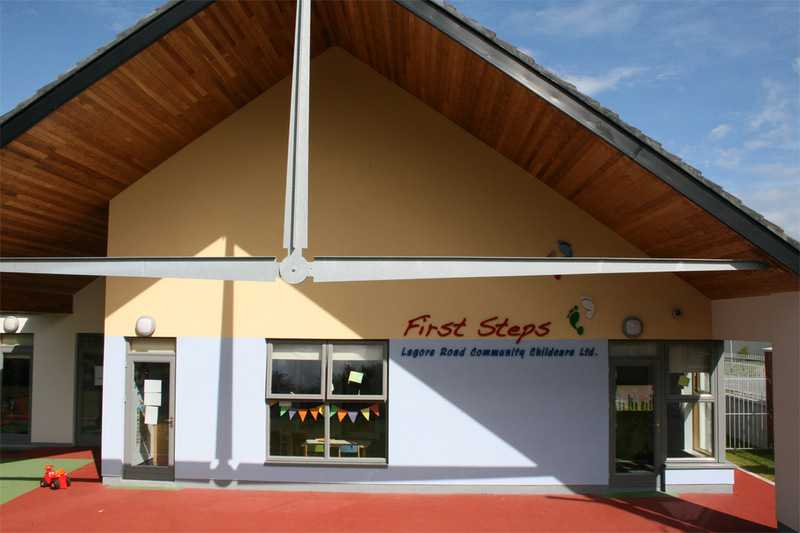 In recently completed Dunshaughlin and Kells community childcare projects, highly efficient air source heat pumps were installed which do not require the extensive groundworks associated with geothermal systems. The performance of the system in Dunshaughlin is currently being monitored by Eurotech and the Nimbus research centre at Cork Institute of Technology which featured in the recent edition of Construct Ireland. Energy efficiency has in recent years become a key driver in building design due to increased concerns about fuel security and increasing standards in the energy conservation elements of the building regulations. 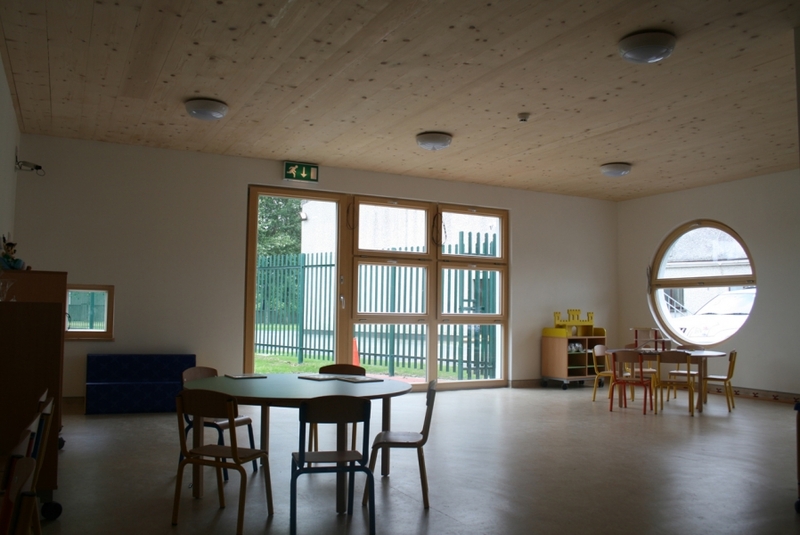 An energy efficient strategy for a childcare project should address the issues of thermal performance and airtightness of the building fabric as well as the ventilation strategy, heating system and the provision of renewable energy sources. Significant cost benefits and energy savings can be achieved under current standards by improvements to the building fabric at design stage coupled with an efficient heat delivery system and control system. Particular considerations in relation to the electrical system include the provision of a comprehensive CCTV system, access control system and the provision of suitable energy efficient lighting. In the event that funds are not available for a CCTV system, it is advisable to at least to hard wire the building at construction stage for a future installation. The access control strategy should be agreed with the management and may be either keypad, personal fob or intercom, each of which has advantages and disadvantages. Wiring the entrance intercom system to each room allows flexibility to staff who are facilitating collection. Motion sensor controls to lighting to infrequently used areas such as laundry rooms, toilets and staff area will be cost beneficial. In relation to accessibility, it is considered best practice that standards of the building regulations (part M 2000) be exceeded. There are issues that are not covered under the current regulations. For example, it is good practice to provide an additional lower handrail at children’s height on stairways. Conflicts arise between for example the height of electrical switches for disabled access and a higher level which may be more desirable in a play room environment. In addition to wheelchair access, the needs of children with auditory or visual impairments needs also to be considered. Play equipment should also encourage interaction between disabled and non-disabled children. Groups involved in current projects should we aware of the recent requirement to obtain a disability access certificate (DAC) for new works and extensions and for changes of use. The certificate is similar to a fire safety certificate application whereby the local authority certify that the works comply with the relevant section of the building regulations. Designers should be aware that a substantial revision in the disabled access provisions of the building regulations is also imminent which will introduce more onerous standards. The projects generally were built as conventional masonry cavity wall construction. This allowed the works to be tendered locally in each case to competent contractors without specialised experience. It was found to be often difficult during the building boom years to tender the state funded projects within the allocated budget – particularly where some EHO’s could request that play rooms areas be increased by 20% above the regulation guidelines. 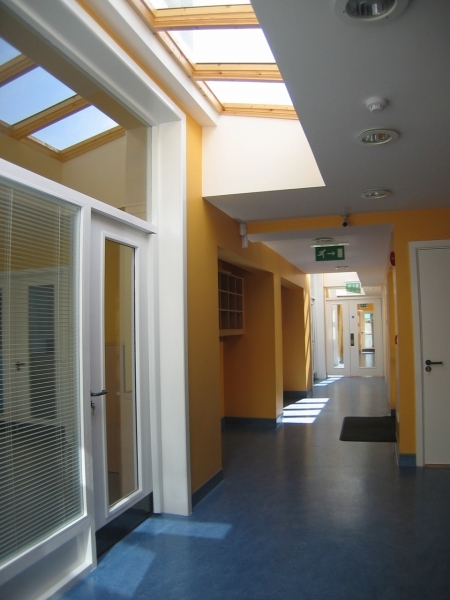 In Summerhill and Navan projects where cost constraints precluded conventional build at the peak of construction costs in 2004-2007, alternative build systems were employed: In Summerhill, a German closed cell timber frame system was employed while in Navan a modular steel frame system was used. The systems offered cost and programme advantages and claim quality improvements due to being party built in a factory environment. Confusion can arise however where the groundworks form a separate contract. Also, options to modify/extend the building in the future may be more limited in the case of a specialised form of construction. Details of our childcare projects can be found here. 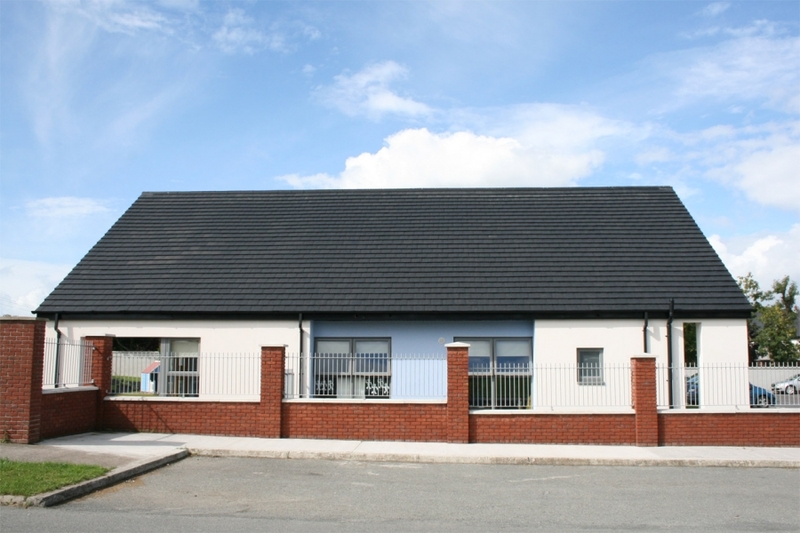 We are a community Childcare Center located in Killorglin Co. Kerry. We have 220 children registered at out center and employ 33 staff so we would be reasonably large for our sector. We are currently trying to engage with a architect firm to explore some possibilities and potentially draw plans to accommodate the existing building and also plan for a substantial extension to same.